Flying Tiger Cub Balm This carefully calibrated balm possesses qualities, derived from the Wintergreen Tel, to remedy muscle or joint pain caused by strains, sprains, arthritis, bruising, or backaches. Flying White Tiger Cub Balm This accurately formulated balm has the healing properties that alleviates afflictions, such as stomach aches, headaches and sore muscles. Flying Peacock Balm This cautiously computed balm acts as a soothing agent for many ailments such as congestion, asthma, cold, toothache, sinusitis, travel sickness, upset stomach due to the healing properties of Pudina ka Phool which forms one of the main constituents. Flying White Peacock Balm Due to the tranquilizing properties of Kapoor, this balm can cure an array of afflictions, such as, toothache, muscular pain and insect bites. Flying Peacock Oil Composed of varying calmative components, this oil possesses a delightful fragrance, but at the same time aids indispositions such as insect bites, tooth sores and muscular discomfort. 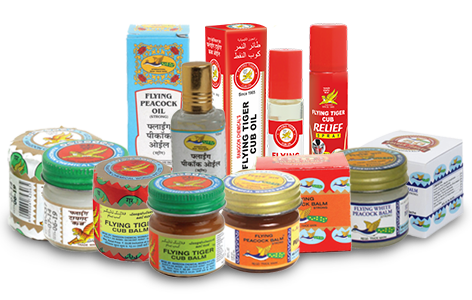 Flying Tiger Cub Oil This ayurvedic formula works not only as a balm but doubles up as an oil to relieve influenza, toothaches, muscular pain and insect bites. Become a distributor for Rangoon Chemical Works Pvt. Ltd.